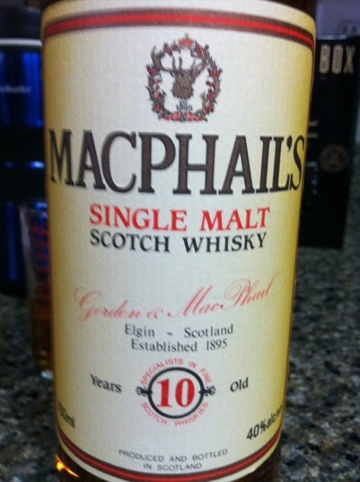 So I was happy to see among several offerings this Gordon and Macphail’s 10 year single malt. I have enjoyed several of their offerings but never a “standard” like this one. I actually enjoy not knowing which distiller they purchased their product from. This mystery malt sat either in a Speyside warehouse or in Elgin at G&M’s warehouse. Regardless, someone distilled it and G&M claimed it. It’s that simple. What isn’t simple is the complexity of this dram. It is very nice, balanced, and has great mouth-feel. The fruit that comes off the nose is nice and I rather enjoyed it without water. After adding water a few more notes open up in the nose and as for taste, it smoothed out like a lake in the morning. The cost of this was exactly 42.99 USD. I believe it to be priced about right (nothing you can do about taxes) and I believe it is distinct enough from the likes of Balvenie and Macallan to set in among your scotch offerings. I would call this a daily drinker but I rather think it special. And so, only a twice or so a week dram. I can always rely on Grant’s as my anytime dram. You could enjoy a cigar with this, but, I’d reserve this as an aperitif or a dinner dram. I’m not an advocate of drinking great scotch with cigars because inevitably, one will win out and the other will be non-present. So if you are lucky enough to pick up one of these, I would encourage you, I think it’s worth a try! No. None in the cabinet right now.